Happy New Year! Heres looking forward to big fish and calm seas! January started in the same way as December and November had gone with endless SW winds. 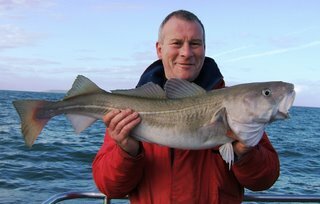 Mark Stewart with a nice 14lb Cod. On a trip that also saw congers, whiting, smoothhounds, dogs and pouts. 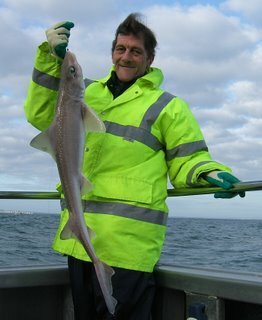 Vivian Swan finaly got out after 4 blown off trips and provided a master of the hounds with a starry smoothhound of almost 10lbs, a similar size common smoothhound and several LSDs. 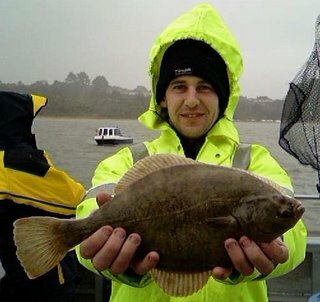 Ian Martin with a 2lb flounder caught mid channel - Wareham channel!